A blocked extra point attempt in overtime set up the Florida Atlantic University football team with a chance for one of the biggest upsets in the program’s 15-year history. Fate, however, had other plans on Saturday as the Owls lost at the hands of the No. 8 Florida Gators 20-14. 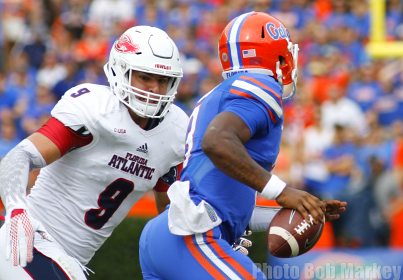 The FAU defense executed its game plan masterfully, forcing five three-and-outs and holding the Gators scoreless into the third quarter. Junior Trey Hendrickson (photo left) recorded five tackles with two sacks, a quarterback hurry and a forced fumble. His fourth-quarter, fumble-forcing hit marked the 16th sack of his career, putting him in a tie for first all-time in the FAU record books. Senior Brandin Bryant also had a sack and a pair of TFLs, helping guide the unit to ten tackles for a loss and five sacks. Punter Dalton Schomp helped out the defense with a pair of touchdown-saving tackles in a game that featured 17 combined punts. The Gators got on the board first at the 9:44 mark of the third quarter after an FAU fumble set up a one-yard touchdown rush. Four minutes later, UF doubled the lead on a 53-yard pass from Treon Harris to Antonio Callaway. FAU’s offense then came alive as Jaquez Johnson and Greg Howell marched the Owls downfield. On third-and-goal, Johnson found Kalib Woods in the end zone for the 10-yard touchdown completion to cut the lead to 14-7. The two teams traded interceptions on the ensuing possessions, including a touchdown-saving pick by FAU’s Sharrod Neasman in the end zone. The Gators picked off a pass in the red zone, but couldn’t convert as they missed their second field goal of the game. Schomp punted 59 yards to pin the Gators inside their own 10-yard line with just under nine minutes left. On the second play of the drive, Hendrickson tracked down UF’s Harris, stripping him of the ball on a sack at the three-yard line. Freshman Ocie Rose corralled the ball in the end zone for his third defensive touchdown of the year, tying the game at 14 all. The two squads combined for one first down over the next six drives to send FAU to its second overtime game of the year. The Owls won the toss and elected to go on defense. After a pair of rushes to get inside the FAU 15, Harris dealt a 13-yard touchdown pass to Jake McGee to go up 20-14. On the extra-point attempt, Nick Internicola leapt and swatted the ball away, giving the Owls a chance on their possession. Johnson found Jenson Stoshak for five yards on the first play and ran for eight more to get a first-and-goal at the nine. Three-consecutive incomplete passes followed, including two just off the fingertips of FAU receivers to end the upset threat. The Owls go on the road to finish the 2015 campaign with a Nov. 28 game at Old Dominion in Norfolk, Va.